If you were an incarcerated youth, what could be more inspiring than knowing that in spite of all the bad choices you have made, there are people in the community that still have faith in you, are cheering you on and that Jesus loves you? That’s what we want to tell the kids at Echo Glen this Valentine’s Day – WE CARE and Jesus Loves them! 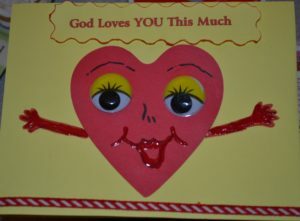 We hope to give 10+ hand-made Valentine’s cards/letters to each of the 135 boys and girls. These can be made by fellowship and Bible study groups, youth groups, or compassionate individuals. The cards can include personal notes of encouragement, fun jokes and riddles, uplifting quotes, and scriptures such as: Jesus Loves you; You are beautiful in God’s eyes; God loves each of us as if there were only one of us-St. Augustine. All should be encouraging and inspirational – most of these kids have very low self-esteem. Feel free to include small candies too (best to leave out candy on sticks). To participate, please let us know how many handmade cards your group would like to make; or if you want to ‘adopt’ an entire cottage of 15 to 18 youth and can make 10 folders of 15 to 18 different cards. You will get the first names of the youth 4 or 5 days before Valentine’s Day. Many of us make the cards in advance and then go back and then personalize each card with the youth’s name the week of the 14th. Hope you can help share God’s love for these kids through Valentines! Please email susan@smilepower.org if your group would like to participate.